Well, I hope all of ya'll had a great (and yummy) Thanksgiving and wrapped it up with a relaxing weekend afterward. We went to my sister's house Thursday, Friday I prepared everything for a birthday party for Lindsie (turning 11!) that happened yesterday at the bowling alley, followed up by a sleepover for 6 girls (minus one--didn't feel so well)! Whew! I'll be glad when Monday rolls around. The girls will be back in school and I can go shopping and enjoy the quiet for a change while the holidays get rolling. Today I have another Sneaky Peek from The Cat's Pajamas. This time the Cat Pack is featuring the new set, Raising Cane. Isn't that a fun play on words for a set with a Candy Cane? I love it! That Alma, she's clever like that. In October, when I went to Houston for a scrappy/stampy trade show, there was a cute treat bag similar to this one done up for 4th of July with the wire tinsel handle, so I thought it would be cute to make this version for Christmas and uber-cute to use stamps and dies from The Cat's Pajamas! 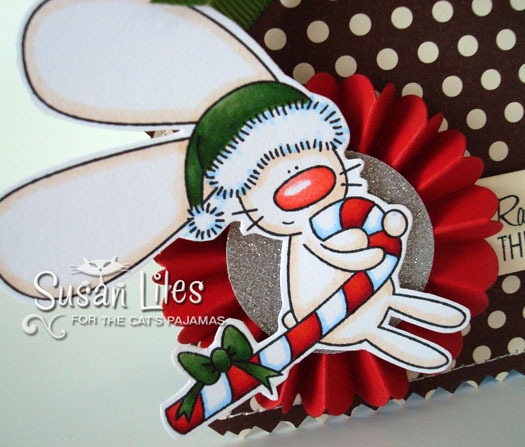 The bunny rests on top of a flower made from the Easy Rosette CutUps die and I also used the NEW Anywhere Ribbon Slide CutUps die available on Monday night after the Pajama Party which will be right HERE on Splitcoast. The beauty of this die is that you can place it anywhere and it will cut slits to weave ribbon, etc. rather than just a punch that only reaches so far away from the edge of your paper. You'll see more of what I mean with my peek tomorrow. Wink! Be sure and check out more inspiration and peeks by heading to Alma's blog, Dancing in Pajamas today and every day through next Tuesday to see what else is new and FABULOUS!! Don't forget to visit us in the TCP forum on Splitcoast HERE. All you have to do is comment there to be IN IT TO WIN IT and you could win this stamp set! 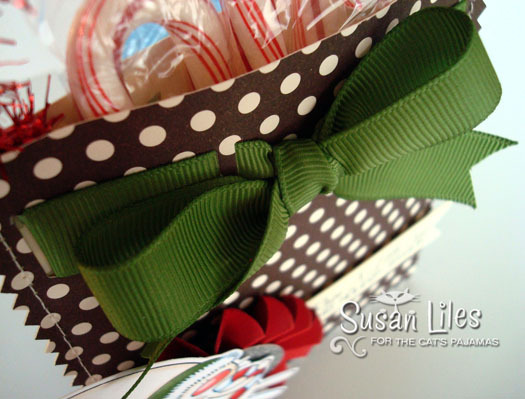 SUSIE Q-TIP: Make a fun treat bag like this one. I simply folded a piece of paper in half, sewed three sides (including the folded side), and trimmed the edges with pinking shears. Just make sure you use your Anywhere Ribbon Slide CutUps die before you sew the edges. Don't ask me how I know this. I don't want to talk about it. 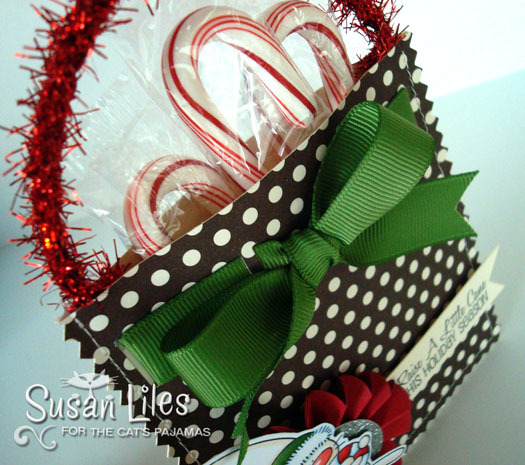 Finished Size: Approximately 4" x 4.5"
Such a sweet candy cane holder for hanging on a doorknob or on the back of a chair. Candy canes never had it so good. Ooooh!! I read about things I might neeed!! That image and your project are both so cute. I love the idea of the ribbon slide die and I'm off to check out the rosette die. Thanks for sharing! Fun and festive! Love all the sparkle.